Ukrainian opposition leader Viktor Yushchenko's mystery illness was caused by poisoning, his Vienna doctors say. 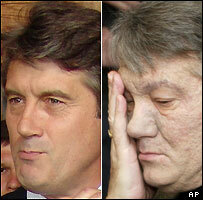 The doctors said extensive tests showed a form of dioxin had been used, leaving Mr Yushchenko's face disfigured. Mr Yushchenko, 50, was taken ill in September as he campaigned for disputed elections that have now been declared invalid because of irregularities. His supporters staged mass demonstrations against election fraud after his opponent Viktor Yanukovych was initially declared the winner. The second round is now being re-run on 26 December. Analysts say he would have to dispel any doubts about his health before becoming president. In Washington, a state department spokeswoman said the United States was "deeply concerned about these findings" and urged Ukrainian authorities to investigate. The opposition leader has accused the Ukrainian authorities of trying to poison him - a charge they reject. "There is no doubt about the fact that the disease has been caused by a case of poisoning by dioxin," Michael Zimpfer, the head doctor of the Rudolfinerhaus clinic where Mr Yushchenko is undergoing treatment, said. The question of who was responsible was a matter for the judicial authorities, he said. Dr Zimpfer said the substance was soluble and could have been administered in something like soup. The doctors said their findings were backed by clinical observations and the study of blood and tissue samples. This was the first time since the event that they had conducted biopsies, they said. Mr Yushchenko's blood and tissue registered concentrations of dioxin 1,000 times above normal levels. There appeared to be little lasting damage to Mr Yushchenko's internal organs, though experts say it could take more than two years for his skin to return to normal. Mr Yushchenko said on arrival at the clinic on Friday that his health was getting "better every day". Dioxins are common pollutants - produced as the result of many industrial processes. But toxicologists say little is known about the effect of such a large single dose. "It's usually low-level, long-term poisoning," Professor John Henry of London's St Mary's hospital told the BBC. "A very large dose, nobody has any real idea of what it would cause. Now we do know."